Happy Sunday everyone! In honor of the start to the Christmas season I’m taking a look back at some of my favorite festive outfits from last year. Which one is your favoirte? They alll look stunning. The sequin skirt and the last look are my favorties! Love all of your holiday looks! My absolute favorite is the 3d one! It’s just so elegant, chic and feminine – perfect for Christmas celebration! Wow!! So stunning! All of these looks are so inspiring! Perfect for the holiday season. Beautiful looks, love them all! My favourite has to be the first time! Not just the outfit, but everything about the photo, especially the snow! Ah, the sequin skirt is my absolute favorite! love these holiday looks especially the last one! So pretty, love the sequined skirt. Such a lovely look back! I can’t wait to see your pregnancy style. Such great outfits! 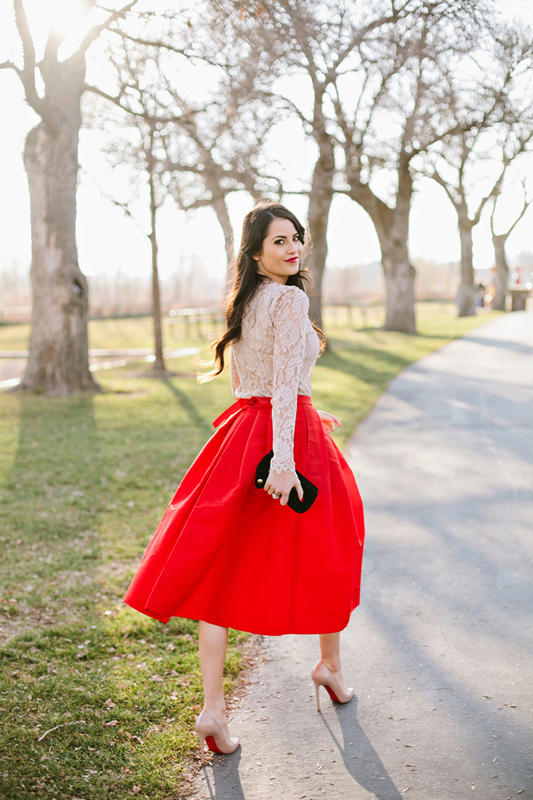 I really love the one with the red skirt and lace top! What beautiful photos! I love all your holiday outfits. I love the first one! The hair style is so classy! It’s a toss up between the silver sequin skirt and the tulle skirt! I can’t possibly pick! You have gorgeous and festive looks. Love these looks! So chic! You rocked the turtle neck, sequin skirt and high bun! Flawless look! *Note to self: Must get sequin skirt immediately! Can’t pick between the final two looks, both gorgeous and very much in my style wheelhouse! Stunning! That last one is my absolute favourite! Ahh how gorgeous is this post! The snow is stunning, and your outfit is absolutely perfect. Love that dress,so perfect for the holidays! Love the Tibi skirt and Milly top look with the Louboutins. All are perfect! Dear, I believe those are called “sashes”. Love your sophisticated and pretty styles! All the looks are beautiful and especially like the cute bow shoes in the last picture, really sweet and romantic! Love these Christmas looks! Red really suits you – on lips, as clothes and shoes! Does it get very cold during the winter months? I see there’s a lot of snow in the photos but you’re not all packed. I remember all of these looks! Hard to believe that I’ve been following your blog from the very beginning and you posted photos of little boy outfits that you sent to Drew and he said, maybe in a couple years, and now you are expecting. So exciting! I can’t wait to see you transition into a mother, although you already have great experience being an aunt to Capri. So happy for you and all of your success!! I love them all Rach, perfectly styles, but if I had to choose it would be the sequin skirt outfit, festive yet edgy! Love all your outfits.The last one is the best! I love the tulle skirt! I’m thinking of DIY-ing one. I’ve been meaning to do it for ages… Definitely on my Christmas to-do list! Love these! Especially that second look with the sequined skirt and Valentino heels. Amazing! That sparkle skirt is AMAZING! All of these looks are stunning. Thanks for sharing. I love all these looks but my favorite is the sequin skirt! I love all of these! So festive and holiday perfection! Congrats on the bump!! Such a fun post!! The beautiful thing is that each look is so very different for such great ideas!! I must say the one with the tulle skirt and red Valentino bow heels is my absolute favorite!! The close second is the sequin skirt with black. Always so beautiful!! love the last outfit!! :) in love with tutu skirts!!!!!! so many pretty looks! the last one is my favorite! I love both of the looks really nice outfits. Rach, do you have any suggestions for a holiday outfit for guys? Something incorporating red so it goes with the theme. you are so perfect!! Love all of your glamorous looks!